Welcome to Best VPS Reviews by Scott Buehler. I'm going to show you my expert opinion and review of the top VPS providers in 2019. I'm sharing everything from my own experiences to off-site resources. Here you'll learn everything you'll need to make a VPS purchase decision that is right for your needs. Hello! Welcome to Best VPS Reviews! My name is Scott Buehler and I own and operate many websites on the Internet, some of which require much more server power than what a shared simple hosting service provides. Here at BEST VPS Reviews, my goal is provide you with my personal assessment of several of the most popular VPS Hosting providers out there. How much does Scott love InMotion Hosting? This site is actually hosted on an InMotion Hosting VPS right now! I'm practicin' what I'm preachin' baby! InMotion Hosting has been nothing short of awesome for me. When I ask a question, I honestly feel like I am part of a family over there. Their customer support is not outsourced and based out of United States with a support staff that averages over five years of experience. Thing is, you really get the feeling they know what they are talking about when you go to them with an issue or concern. InMotion Hosting is a full service company offering a full upgrade path from business-class shared web hosting all the way through powerful dedicated servers. This means you can grow your company past their VPS to a dedicated server without the painful process of switching a hosting company (they'll do the transfer free). What Scott Likes: There's a lot to love about this company! Customer service is easily found. Right on the VPS page, I see 3 mentions of their toll-free telephone number, one mention of live chat, and an email form on the bottom. They are eager to help you, that's simply obvious. Quality. Their service is top-notch. I haven't had any major problems with them in years. 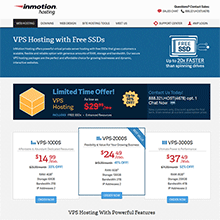 I go into more detail on my InMotion Hosting VPS Review, be sure to check that out. Ready for growth. Say you launch a forum based on your favorite niche, your audience LOVES it and it spreads like a high-wind wildfire, you can easily upgrade to a higher VPS plan or even a powerful quad-core Intel Xeon dedicated server if needed. What Scott Dislikes: InMotion Hosting has drastically improved this in 2015 over our complaints in 2013. Now that they have improved the VPS-1000 plan to include sufficient RAM for most applications, you can choose the VPS-1000S plan and you'll be set. Currently, through this site you'll get a massive 33% discount for $14.99 on the first month and a massive $29.99 discount rate on the other 11 months. Your total is $344.88 for the entire year. 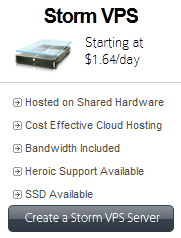 I challenge you to find a premium VPS host that offers this hardware configuration for cheaper. Don't need a VPS and want to save over 50% off their normal rate? Try our special InMotion Hosting business hosting order link for huge savings. 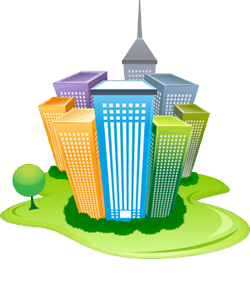 As your site grows and earns money, THEN upgrade to a faster VPS. KnownHost has great multi-CPU VPS Plans! Scott loves KnownHost and has used them for years and years now. A very reputable (see review) VPS host that has a lot to offer. Scott's favorite VPS plan from KnownHost is the HY1 hybrid. His sites load quick, perform to his highest expectation, and fully deserves their ranking here. I've been using KnownHost personally and professionally for well over six years now. I've been through some serious hardware failures, some minor outages, and have never once thought to leave them. Why? Every time I email KnownHost, I get rapid responses. Every single time I ask something that I feel is beyond what they should do for me, they happily do it anyway, without question or without getting something back like "OK Scott, we'll do this once for you, but after that, there's a $200/hr fee." KnownHost is a VPS company through and through. KnownHost, since they launched in 2005, has fully focused on the VPS niche and later on added a dedicated server upgrade path for people that exceed the needs on their fasted VPS server. I have the longest history with KnownHost with a ton of tickets and information to share with you. If you are interested in this company, check out my KnownHost VPS review and see what I have to say first, it's long, but worth it. What Scott Likes: Late December 2012 brought all sorts of changes at KnownHost. KnownHost removed the Hybrid VPS packages and expanded the VPS packages. All plans saw a RAM increase, most saw a space increase, and those that had a Hybrid server likely saw a decrease in price. I went from the HY-1 server to the VPS-6 plan and saved about $20/month. I now recommend the VPS-1 plan as it has suitable memory to have cPanel/Plesk installed for beginning VPS customers. If the memory still boggs you down, just upgrade later (it's free!). By the way, isn't the KnownHost logo sweet? I love letter play in logos, like my TopFiveAwards (hosted at KnownHost!) site logo that I drew up and had made. On April 10th, 2013, KnownHost released a whole new look for their website and forums. I've updated the site with the new look on April 21st. 2013. Sorry for the delay, was working on my How to Create a Website video series. What Scott Dislikes: For me personally, I'm not liking the forced data center selection. I remember when I saw that the first time and spent an hour or two online researching the KnownHost forums, other forums, Google searching, and more just to figure out where I should run my VPS from. Hint: The Texas data center is where KnownHost started and thus, where most of their VPS plans are hosted. LiquidWeb is my favorite premium VPS company. You want VPS power on a premium quality network at a premium price? Get your premium on at Liquid Web because these VPS plans are as premium as premium can get. Premium. Ya dig? Liquid Web has always been a strong VPS company that stands behind their Heroic Support® (Heroic Support is a registered trademark of Liquid Web, Inc.). These guys are a top-notch VPS company backed by a massive 300+ support staff that has engineers with specialties in technical support, server setup, networking, security, and more. This is one of those companies that if they offered me a job, I'd be hard pressed to not accept it even though it'd be in Lansing, Michigan, brrrrr! But heck, those cold winters up there probably help with server cooling costs, right? 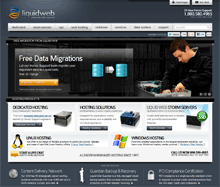 Liquid Web is amongst the top referred VPS service in my research. Most of their customers are happy, thrilled to be a part of their family, and constantly recommend them. I'll show you a lot more of what I mean by all of this in my Liquid Web VPS review with actual sources. What Scott Likes: LiquidWeb has some awesome things going for them. They are the first major VPS brand that I've seen that has offered lightning quick SSD hard drives as an option. If you have a massive site such as a popular Internet forum, a heavily trafficked blog, or some other site that required heavily database usage, Liquid Web is most likely your best solution. The other issue is the naming scheme. I'll go into more detail in my Liquid Web review, so be sure to check out my hard work there. Now that you've been informed. Yes, I also earn referrals if you purchase through some of my links. The difference? I want to earn it. If I haven't helped you in any way, then I haven't earned it. Did I earn it? Well, that's the goal! Use the orange "Visit" buttons and make your purchase. If that VPS host has a referral program, I'll earn a little money (don't worry, it won't cost you extra). If they don't, you'll still get an awesome VPS and I'll be happy to simply have helped you. I use any money earned to enhance the services here, pay my hosting bills, and of course, feed my wonderful family of 5. This isn't a hobby for me, if I don't earn your trust, I can't feed my family, this is my job. For personal service, contact Scott here, I REALLY want to help! I'm having a lot of fun with this site and I hope you've had fun reading (and learning) about these VPS hosts via my reviews. I've only got three reviews for the top VPS hosts on this site but currently working on more. What's your favorite VPS? Hit my contact form and let me know about them for my review consideration! Thanks for viewing! This site was last updated and checked for accuracy on February 12th, 2015.